Saints Faith-Hope-Charity are a group of Christian martyred saints. Their mother was Sophia. According to the Catholic Encyclopedia, there were two groups bearing the same names. The names are also the words designing the three key Christian virtues mentioned in Apostle Paul's First Epistle to the Corinthians. 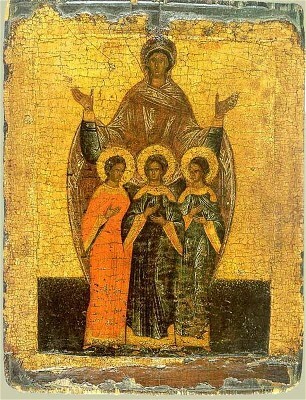 On August 1, "the holy virgins, Faith, Hope and Charity, won the crown of martyrdom under the Emperor Hadrian" and, on 30 Sept., "St. Sophia, widow, mother of the holy virgins, Faith, Hope and Charity". Faith or Pistis was twelve years old; Hope or Elpis was ten and Charity or Agape was nine. In some places, on August 1, St. Sapientia is also venerated.The cult is very ancient, and the names are found not only in the early martyrologies of the Western Church, but also in the Menaia and Menologies of the Ancient Greeks. In the reign of Roman Emperor Hadrian, a matron Sophia, with her three youthful daughters, Pistis, Elpis, and Agape “Greek for Faith, Hope and Charity”, became Catholic martyrs, and all three were interred on the Aurelian Way. Their tomb in a crypt beneath the church afterwards erected to Saint Pancratius was a place of prayer for pilgrims, as detailed in various documents of the seventh century, such as an Itinerarium) still preserved at Salzburg, the list, preserved at the cathedral archives of Monza, of the oils gathered from the tombs of the martyrs and sent to Queen Theodelinda in the time of Gregory the Great. In the reign of Hadrian, a presumably separate band of martyrs, Sapientia and her three companions, Spes, Fides and Caritas (Latin for Hope, Faith and Charity), suffered death and were buried near the tomb of St Cecilia in the cemetery of St. Callistus on the Appian Way.